During a dry period in 1970, when artist Robert Smithson constructed a spiral earthwork sculpture in the Great Salt Lake in Utah, he discovered that the visibility of his creation would be at the mercy of fluctuating water levels. "As an artist, it is interesting to take on the persona of a geological agent and actually become part of that process rather than overcome it," the late Smithson said in 1972, according to a Dia Art Foundation press release. But the elements may momentarily triumph over Smithson's sculpture, as rising water levels threaten to obscure the famous piece known as Spiral Jetty. 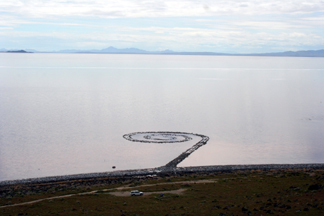 Spiral Jetty began to submerge earlier this spring, as represented in this May 18, 2005, photo. Image courtesy of Mark Milligan. In 1970, Great Salt Lake was reported to have been 1.5 meters lower than the historic average, at a height of only about 1,280 meters above sea level. Spectators could easily walk along the 457-meter-long (1,500 feet) counterclockwise spiral of indigenous black basalt, which measures about 5 meters wide (15 feet). But water levels soon rose and obscured the jetty, only to ebb once again in 1978. For the last 36 years, weather cycles have dictated when Smithson's sculpture would make an appearance. "The jetty has a cyclical presence: being submerged under water, re-emerging encrusted in salt, weathering back to rock and then being submerged again," says Michael Govan, director and president of the Dia Art Foundation. "Its recurring/disappearing act beneath the Salt Lake only adds to its allure." And now, following a 1999 drought that allowed the jetty to reappear three years ago (see Geotimes, January 2003), the spiral may be going back into hiding. "The lake always fluctuates," says Mark Milligan, a geologist with the Utah Geological Survey. "This is one of the greatest rises in lake levels of any spring for Great Salt Lake." Great Salt Lake's levels depend mostly on two factors: precipitation and temperature. And this year, Utah has seen more precipitation than most. A heavier-than-average snow pack, for example, has Utah ski resort Snowbird planning to remain open until July 4, one to two months past its typical closure date for the season. "For some areas in Utah, this is the wettest year on record," Milligan says. Temperature also plays a crucial role because it controls the amount of water that can evaporate from the lake. Great Salt Lake is the fourth largest terminal lake in the world, meaning it does not have an outlet, so evaporation is the primary way by which water escapes. This spring has not seen as much evaporation in the lake because, Milligan says, "this year has been fairly cool." The level of Great Salt Lake is only one-third of a meter, or about one foot, higher than when the jetty was constructed. This may not seem like a significant amount, but because the lake exists in a shallow playa, small changes can result in an impressive reduction to the lake's surface area. According the U.S. Geological Survey, following an over 2-meter drop to a historic low water level, the surface area was reduced 44 percent from its average 2,736 square kilometers to only 1,529 square kilometers. One-third of a meter can therefore make the difference between a submerged or exposed jetty. But for now, not all is lost in the depths of rising water levels. Bacteria and algae thrive in the salty environment, giving a red cast to the lake. From a nearby cliff, visitors can likely still see the slightly submerged spiral in contrast with its colorful neighbors. "It can look pretty cool," Milligan says. "It gives it almost a surrealistic quality, almost like being on another planet."